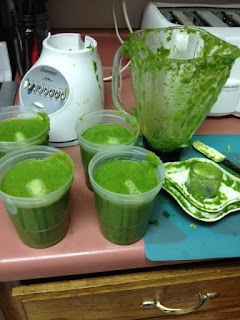 In my on-going attempt to prepare healthy meals and snacks ahead of time, I had the ingenious idea to make a huge batch of Green Goddess smoothies at about 10:30pm last night. My very inexpensive blender from Walmart did pretty good when I made a triple batch a few weeks ago, so why not double that and make 6 Green Goddess smoothies to freeze and have on hand? "Eww it looks like Shrek threw up in here!" said Kid #1 as he entered the kitchen. No, I'm confident if I just hold down the lid it will stop overflowing. But watch out in case the whole thing blows I said. 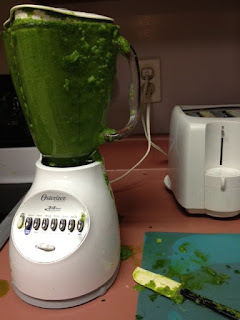 Of course, it did eventually blow and I had Green Goddess smoothie all over the counters. After I cleaned up the mess I was able to save enough for four servings. I had half a serving this afternoon. I would have finished the rest but kid #6 asked for a sip and ended up finishing it all. 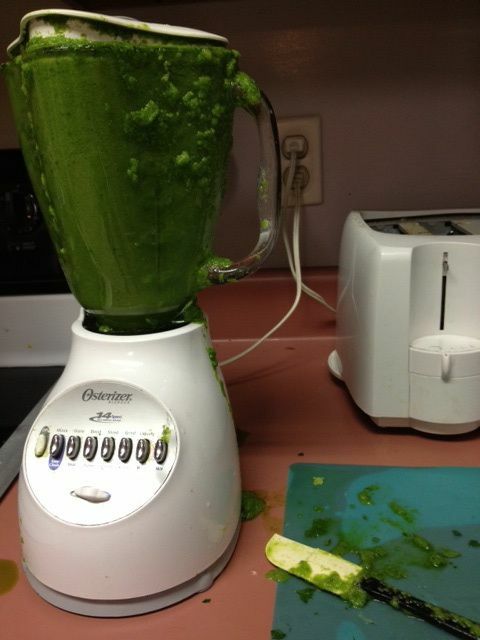 It's time to buy a bigger blender! I can down just a few green recipes, so if you have some halfway decent ones let me know. I have been juicing celery, kiwi and cucumber and it is not bad. Oh, I just know this is going to happen to me one day!